Jonathan Alder’s Jacob Koenig fires in a shot over Fairbanks’ Wyatte Miller (3) Friday evening. Also pictured for the Panthers is Braylon Green, right. Koenig scored 22 points as the Pioneers opened the season with a 57-46 victory. The Panther bench boss was referring to Jonathan Alder’s side of the book and in particular, the number 22 that came after Jacob Koenig’s name. Koenig scored 22 points Friday evening as JA opened the season with a 57-46 victory over the Panthers. The game also tipped off the 2018-19 campaign for FHS. “We told the guys that this was going to be the type of game that 50 points might win it,” said George. “That’s (a slower tempo, lower-scoring contest) the type of game that Jonathan Alder likes to play. “Jacob was a very solid shooter, especially during the first half,” said JA coach Brent Cahill. “It seemed like every play, we got the right play. Koenig basically outdid Fairbanks by himself during the opening half. The senior sharp-shooter tallied 15 points and missed only two shots over the course of 16 minutes. The Panthers, on the other hand, had trouble getting into any offensive flow and scored only 14 points during the same stretch. Koenig got a little bit of help from some teammates as JA took a 23-14 advantage at the turn. FHS held the lead only twice the entire night and both of those margins – 4-2 and 6-4 – were very early in the contest. Cross Hackathorne’s basket gave Fairbanks its 6-4 edge. Koenig tied the game with a jumper and then buried a pair of three-pointers to stretch the margin to 12-6. The Panthers’ final point of the first set came on a free throw by Braylon Green. Another bucket from Koenig and Daniel Heinig’s inside basket on an assist by Jackie Santa-Emma sent Alder into the ensuing quarter with a 16-7 lead. Green cut into the Pioneers’ advantage with a couple of charity tosses early in the second quarter. Koenig, however, nailed one of his four three-pointers to give Alder its first double-digit margin of 19-9. The Panthers’ offensive struggles continued over the next few minutes. JA took advantage of Fairbanks’ misfortunes and built a 23-9 lead. FHS finally reached double digits with 2:38 left in the half when Jacob Nicol got a shot to drop. Nick Murray followed with a three-pointer that pulled the Panthers to within 23-14 at the turn. Mason Smith scored a pair of baskets for Fairbanks as the home team kept up the fight during the third stanza. His second bucket narrowed FHS’ deficit to 28-20. Santa-Emma, though, stretched the lead to 31-20 with a three-ball. Hackathorne’s trifecta sliced the deficit to 31-23, but Santa-Emma sank a free throw and converted a steal into a lay-up that extended JA’s margin to 34-23. Nick Zuro scored on consecutive possessions to give the Pioneers a 37-23 lead. Smith then hit a long three-pointer right before the buzzer that pulled FHS to within 38-26. Cahill was pleased with his team’s defense up to that point. Seth Standley came off the bench for the Panthers and nailed a pair of trifectas. Tyler Beem and Nicol followed suit, but their efforts weren’t enough to overcome the lead that had been built by the Pioneers. Henry Walker, Alder’s 6-6 post-player, also hit several key baskets to help keep the Panthers at bay. The Pioneers will return to action by hosting Franklin Heights on Tuesday. Fairbanks will host West Jefferson on Friday. Koenig 9-0-22, Walker 4-2-10, Santa-Emma 3-1-8, Izzard 2-0-5, Stevens 2-0-4, Heinig 2-0-4, Zuro 2-0-4, Begin 0-0-0. Totals 24-3-57. Three-point goals: Koenig 4, Santa-Emma 1, Izzard 1. Smith 4-0-9, Green 2-4-8, Hackathorne 3-0-7, Beem 3-0-7, Nicol 2-1-6, Standley 2-0-6, Murray 1-0-3, Miller 0-0-0. Totals 17-5-46. Three-point goals: Standley 2, Smith 1, Hackathorne 1, Beem 1, Nicol 1, Murray 1. Alder’s freshmen and JV teams started the visitors on their way to a clean sweep. The JA frosh won the night’s first game by a 38-28 verdict. 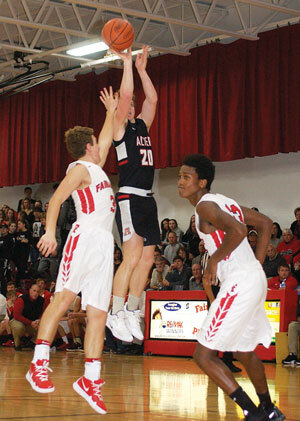 Will Heisler and Tyler Begin led Alder with eight points apiece. Grant Rausch tallied 11 for FHS. Grant Welch scored nine points during the Pioneers’ 43-38 triumph during the junior varsity game. Trey Good led the Jr. Panthers with 10 points.